Alqosh is located 45 Kilometers (28 miles) north of Nineveh (Mosul). It lies at the foot of Alqosh Mountain or the Beth 'Aidhre or Ba'aidhre Mountain. 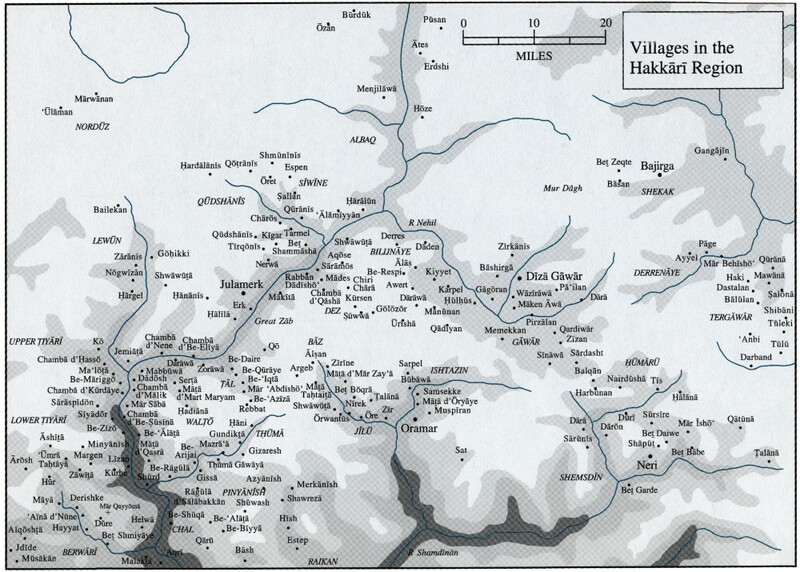 Alqosh is part of the district of Tel Kepe (Telkaif); however, it was previously part of the district of al-Shikhan. This Alqosh should not be confused with another town in Israel by this same exact name. The population of Alqosh has varied depending on the sources and period. Iraqi official census figures meanwhile could not be trusted, since Iraqi governments manipulated the census, especially when it came to the Assyrian Christian population. The population figures from the nineteenth century up to modern times range from some 2,500 to 20,180. Hurmiz Aboona states that in 1850 there were 250 families in Alqosh. In 1867 – 1868, Patriarch Joseph Audo visited his congregation in north of Iraq and stated that Alqosh in 1868 had 2,477 persons. Scholar Joseph Shikho visited Alqosh in 1895 and stated that its population was 5,000. In 1913, Fr. Joseph Tifankji wrote that Alqosh population at the turn of the twentieth century was 7,000. In 1937, Fr. Estefan Kajo (later bishop) conducted a census of the town and recorded the population at 8,475. In 1950, Fr. Raphael Bidawid (later patriarch) conducted another census at the request of Bishop Estefan Kajo and reported the population at 9,500. 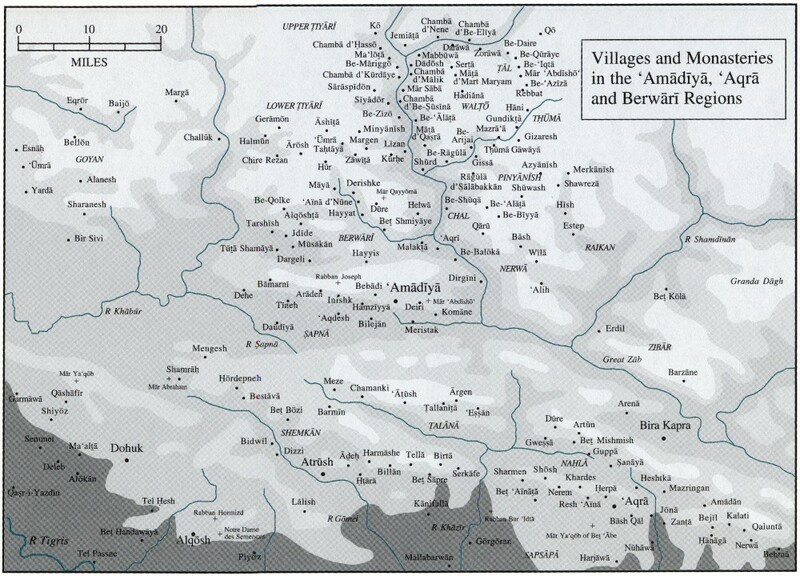 In 1961, scholar Giwargis 'Awwad put the population at 7,000. Today, the population, which is all Assyrian (also known as Chaldeans and Suryan), is estimated at 6,000. The name Alqosh (or Elqosh) is derived from a compound Assyrian Akkadian name Eil-Kushtu, where "Eil" means God and "Kushtu" means righteousness or power. Therefore, Elqosh, or as casually pronounced Alqosh, means "The God of Righteousness" or "The God of Power." The name "Alqosh" could also be originated from the Aramaic "Eil Qushti," which means "The God of the Bow." Here, an association could be drawn in conjunction with the winged disk symbol of God Ashur holding a bow. Meanwhile, in Aramaic language, rainbow is referred to as "Qeshta d' Maran," therefore, the meaning of the "Bow of Our Lord," is possible as well. Alqosh is known also as Yimma d' Athor (Mother of Assyria) or Yimma d' Mathwatha (Mother of all Villages). Since its establishment, Alqosh has played a major role of worship for early Assyrians and Jewish prisoners who were brought by the Assyrians during the eight and ninth century B.C. With the spread of Christianity in the Assyrian province of Adiabene (Arbil, Kirkuk, Mosul, and in certain times extended to Edessa), the Assyrians of the Nineveh plain (including Alqosh) were among the first people who accepted the message of Jesus Christ. According to the memoirs of Mar Mikha of Nohadra (modern Dohuk), he visited the town in 441 A.D. Mar Mikha wrote that he was welcomed by priests of a church that was build on the ruins of ancient Assyrian temple. This proves that Christianity was present already before his arrival and churches existed. According to some sources, Mar Mikha built a school whose traditions continue to this very day. With the birth of the schism in the universal church, Alqosh became naturally part of what was wrongly known as the Nestorian or Persian Church. It remained as such until the spread of Catholicism in the Mosul plain. Officially, it remained a Nestorian town until the official establishment of the Chaldean Catholic Church in 1830 by Mar Youhanna Hurmiz. Of course, there were Catholics before this date in the Mosul (Nineveh) Plain. Earlier, Alqosh had acquired a special place with the arrival of monk Hurmiz (Hormiz) who built a monastery in A.D. 640 that took his name. This monastery (Rabban Hurmiz) was used later as the See for many Patriarchs of the Church of the East from the fourteenth century to the middle of the twentieth century when the see was moved to Baghdad. Alqosh became the center of a controversy in 1551 when Nestorian Assyrian Youhanna Sulaqa, the head of the monks of the monastery, decided to join the Catholic Church. He opposed the hereditary process in selecting new patriarchs, which was practiced those days. Catholicism began to enter Alqosh around 1762 when Shamasha (Deacon) Hadbesha accepted Catholicism at the hands of Patriarch Joseph IV in Amid (Diyar Bakir), in modern Turkey, and started propagating it upon his return to Alqosh. In 1830, patriarch Youhanna Hurmiz officially submitted to the Vatican, the Chaldean Catholic Church was officially established in Iraq, and the new Catholics acquired the title Chaldeans instead of their original title Nestorians. Mar Mikha al-Nohadri (Mar Mikha of Dohuk). The modern structure dates back to the era of Patriarch YabAlaha VI (1578 – 1580). It was renovated in 1876; however, the original school attached to the church was demolished and a new one was built in 1922. Mar Giwargis Church. Perhaps the first church in Alqosh, however, the present structure dates back to 1906, which was built after the old church, was demolished in 1904. Certain manuscript dated 1680 refers to the church. Mart Maryam (St. Mary) Church. This church was established in 1806 and renovated in 1854. In 1930 it was about to fall; therefore it was demolished and built anew. Mar Yousif (St. Joseph) Shrine. A small shrine surrounded by a cemetery for children. Mar Youhanna Shrine. A very small shrine south of Alqosh. Mar Qardakh Shrine. Ground breaking for this shrine took place in 1937. It was built to commemorate St. Qardakh. St Qardakh was a Zoroastrian; however, he converted to Christianity and insisted to remain Christian even when threatened by Sassanid King Shapur to be killed. Mar Qardakh was stoned to death in A.D. 359. However, the most distinguished religious structure in Alqosh is the Rabban Hurmiz Monastery. Rabban Hurmiz came to the Alqosh Mountain after spending several years in Dair Resha (The head monastery) with his colleague, Rabban Yozadaq who also left to the Nuhadra Mountain. 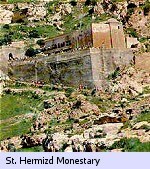 The monastery was built in A.D. 640 during the patriarchate of Isho-yab II (A.D. 628 – 644) and with the assistance of two Ninevite princes who witnessed miraculous healing by Rabban Hurmiz. It became a famous location of learning and religion especially during the tenth to twelfth century, which brought up such Syriac fathers as Mar Yohanna of Halabta, Isho Barnon, Mar Ipni Maron, and others. The Monastery (Dair) Rabban Hurmiz is the most famous and most visited monastery in Iraq. Dair Rabban Hurmiz was the holy seat of the Patriarch of the Church of the East for several generations. The monastery overlooks a famous valley called 'Gali Al-dair' meaning 'valley of the monastery'. 'Shara d' Rabban Hurmiz' or 'the festival of the monk Hurmiz' occurs every third Monday following Easter Sunday. Until a few years ago, the monastery was not reachable by automobile nor did it have electricity or running water. The monks relied on mountain springs and oil lamps for everyday life. The monastery contains several wings including a church with several alters, a burial site for saints and patriarchs (Beth Sahdeh), a library currently containing manuscripts as old as 1497, 'Beth Sahdeh' or 'house of martyrs,' 'Beth U'matha' or 'house of baptism,' and over 40 small caves used by monks scattered all over the Alqush mountain. Some of the caves contain numerous carved writings pertaining to the date of establishment as well as other historical details. The monastery also includes large rooms carved in the mountain stone including a large dining room able to hold over 100 monks. This truly amazing 800 sq. ft. (15 ft. high) dining room is completely carved inside the mountain with small vertical portions were uncarved to act as support beams. Patriarch Youhanna Sulaqa: He was born in Alqosh in 1513. He was imprisoned by the governor of Amadiya and perhaps killed while in prison on January 12, 1555. Patriarch Youhanna Hirmuz: He was born in 1760 from the famous Aboona family (which gave birth to many patriarchs for the Church of the East). He accepted Catholicism in 1826 and established officially the Chaldean Catholic Church 1830. He passed away in 1837 in Baghdad. Patriarch Joseph VI Audo: He was born in Alqosh in 1793. He was consecrated as the patriarch of the Chaldean Catholic Church on September 11, 1848. He passed away on March 14, 1878. Patriarch Joseph Emmanuel II Toma: He was born in Alqosh in 1852. He was consecrated as the patriarch of the Chaldean Catholic Church on July 9, 1900. He passed away on July 21, 1947. Patriarch Paulos II Shiekho: He was born in Alqosh on November 1, 1906. He completed his Ph.D. in Eastern Studies from the Oriental Institute in Rome in 1933. He was consecrated as the patriarch of the Chaldean Catholic Church on January 16, 1958. He passed away in Baghdad on April 13, 1989. Mar Toma Audo. He was born in Alqosh in 1853. He was murdered by Kurds and Turks during the Assyrian genocide in 1917 while serving the Assyrians as an archbishop in Urmia region, Iran. Alqosh is an old Assyrian settlement, most probably older than 800 B.C. It gained popularity perhaps because it is mentioned in the Old Testament in connection with Prophet Nahum, who preached in Assyria between 726-697 B.C. It is worth mentioning that Nahum is buried in Alqosh. The presence of the Seat of the Church of the East patriarch in Alqosh, gave the town a special importance for the Assyrians and foreigner alike. The depository at the Monastery of the Rabban Hurmiz contains valuable manuscripts and documents about the history of the Church. Alqosh was the main source for manuscripts for all the villages of the Nineveh (Mosul) plain between the sixteenth and nineteenth centuries. Scribes, throughout the centuries, have copied manuscripts for the monastery, including only for an example, a prolific priest Joseph son of priest Giwargis, who copied at least twenty-six manuscripts from July 1696 to May 1738. Many studies have been made about this wealth of information in the town. One of such study is "The School of Alqosh: The Literary Culture of the Church of the East Between 1550 and 1800." This is a project that started in the late 1990’s and resulted in the publication of a dissertation in 2002 (Alessandro Mengozzi, Israel of Alqosh and Joseph of Telkepe: A Story in a Truthful Language and Religious Poems in Vernacular Syriac (north Iraq, 17th century) through Corpus Scriptorum Christianorum Orientalium 590 & 598, Peeters, Leuven 2002). The project included in addition a number of articles. The project is planned to be completed and published in 2005 with a monograph on the cultural history of the church of the east in the ottoman period in northern Iraq, covering themes such as the interaction with the west and the western church, the renewal of the manuscript tradition (including the production of manuscripts), and the writing of Neo-Aramaic. One of the famous writers in North of Iraq was Israel of Alqosh. The fame of Israel of Alqosh in both the Western and Suraye (Assyrian) tradition rests upon his work as a copyist and a writer in the classical language and as a poet in the vernacular. Israel of Alqosh is considered a prominent leader and inspirer of what is called the School of Alqosh, a term scholars grouped a number of Suraye maddenhaye (Eastern Assyrians or Syrians as used by some theologians) writers who worked on the revival of the scribal and literary activities from the second half of the sixteenth century in North of Iraq. The year 1611 was a productive year for Israel of Alqosh, who was born in 1541. The late Bishop Yousuf Habbi explained by stating that it was in that year when Israel of Alqosh had to face a destructive, infectious spreading plague in his village but succeeded in writing the whole of his production in the vernacular language. According to J. M. Fiey, 1611 was also the year that Israel of Alqosh converted to Catholicism. In the collection of ‘durekyata’ dated 1879, Fiey read a version of ‘On Perfection 51’ in which the contraposition between maddenhaye ‘Eastern people’ and yaqubaye ‘Jacobites’ is dramatically replaced by the contraposition ‘Eastern people’ vs. ‘Nestorians’. According to the text used by Fiey, it was not the Jacobites who debased the true faith—as the text recites in all the other available witnesses, but the Nestorians. Instead of appealing to Suraye maddenhaye pride and orthodoxy, Fiey’s Israel of Alqosh would have disowned here the dross of Nestorianism attached to the pure apostolic faith of the Suraye maddenhaye tradition. A pure ‘Eastern’ community would have been born again after the Nestorian error. Of course, this reading was music to the Catholic ear of missionaries working hard for the reunion with Rome from the 16th century onwards. Alqosh is beautifully located on the foot of a mountain carrying its name. It is surrounded by a valley to the south were varieties of crops are planted, and another valley to the west through which a water stream runs through. Alqosh is blessed by many natural attractions such as the many caves such as: Cepa Smoqa (The Red Cave); Cepa d' Maya (Cave of Water); Cepa d' Netopa (Dripping Cave); and Shwetha d' Ganowe (The Thieves Bed). During the Assyrian era, this cave housed a temple for the Assyrian God, which Alqosh took her name from as mentioned earlier. Alqosh, its disasters and the Attacks of Invaders During the period of 958 and 978, many of the villages of the Mosul Plain witnessed destruction due to the war between the Hamdanites and Buyids. The Buyids, a tribe from the fringes of the Caspian Sea, had controlled the region in one way or another from 945 to 1075. Between 1258 and 1401, the Mongols (after adopting Islam) and later Timurlane (Taymorlang) attacked the Christian villages, Alqosh, and its monastery. The monks were forced to flee. The monastic life returned to the monastery a few years after, but on a smaller scale. 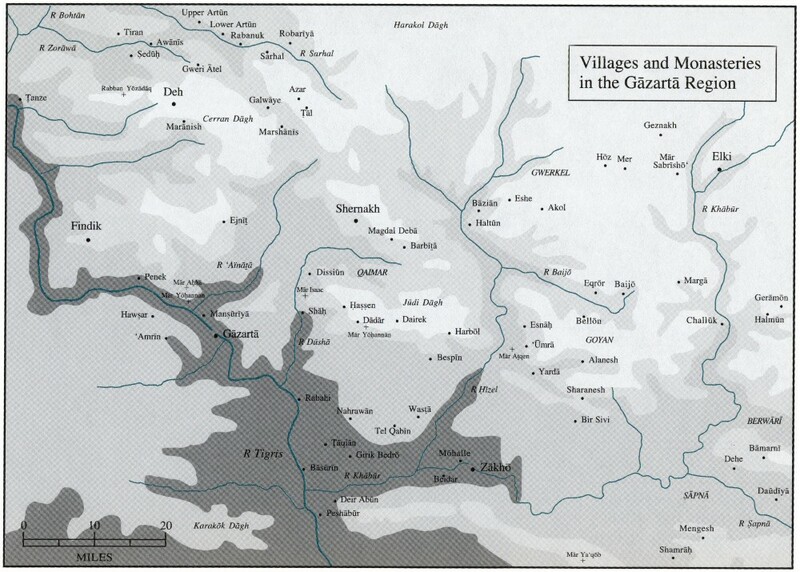 In 1508, Murad Beg attacked and plundered the monastery of Rabban Hurmiz as the citizens of Alqosh sought refuge there, states David Whilmshurst. The Rabban Hurmiz Monastery, which was used as the seat for several patriarchs of the Church of the East, attracted the attention of several Muslim governors of its surrounding areas. In 1578, a Kurdish force of 10,000 attacked the Assyrian city of Urmi, Iran, and killed, looted and carried off over 1000 Assyrian prisoners. Soon after this, the Turkish Pasha of Rawandoz sacked the villages of Alqosh and Tel Kepe, and pillaged the monastery of Rabban Hurmiz, killing many monks and one bishop. In 1743, Alqosh was pillaged by the Persian army of Nader Shah. According to a letter dated 1746 and written by the Priest Habash Bin Jom'aa, the writer describes the destructive acts of Nader Shah. The letter states that Nader Shah first attacked Karamlesh, stole its people valuables, and kidnapped many of its children and women. Next, they attacked Bartella and committed the same on its Christian inhabitants. They did the same to the people of Tel Kepe (Telkaif) and Alqosh; however, many of those two neighboring villages took refuge at the Monastery of Rabban Hurmiz. Nader Shah and his troops surrounded the monastery and then attacked in what has been described as a pack of hungry wolves attacking helpless sheep. They committed some of the most horrendous crimes a human being can commit. Whilmshurst states that scribes, such as Yalda, son of Abdisho, began in 1744 to copy the various manuscripts at the monastery of Rabban Hurmiz in order to secure their survival and later by scribe Saliba in 1756. In 1828, the army of Mosa Pasha, the governor of Amadiya, who was instigated by some of his Muslim subjects, attacked the Rabban Hurmiz Monastery. His army arrested and imprisoned several monks and priests and caused tremendous damage to the monastery. In that same year of 1828, a devastating plague hit the villages of Mosul plain. Whilmshurst reports that 700 people lost their lives, including 27 priests and 17 deacons. In 1832, Whilmshurst reports that Alqosh was attacked again by the Soran Kurds of Rawandos. Some 300 of Alqosh's inhabitants were killed, the survivors were robbed, and the tomb of Nahum destroyed. According to church records, the Kurdish leader Merkor attacked Alqosh again on March 15, 1833, and killed another 172 of its men, besides children and women. In 1840, Alqosh was attacked by the brother of Merkor, Rasoul Beg, who surrounded it for several months after which he lit on fire the Rabban Hurmiz Monastery and also stole over 500 of its valuable books. In 1850, the monastery was raided again by Kurds and over 1,000 manuscripts were destroyed when a stream flooded a small building in which they have been stored. In 1879, a famine hit Alqosh hard and suffered great losses. In 1902, a cultural disaster fell upon the Assyrians and to the town of Alqosh. During this time struggle between the Nestorians and the Catholics were at its greatest limits. A group of the missionaries arrived from Mosul. They told the residents that they were collecting all the rare books and moving them to a library in Mosul. Many people gave their books away. Then, the missionaries removed all the valuable books that date to the fourth century from a secret room inside Mar Mikha al-Nuhadri and gathered these entire books at the yard of the Mar Mikha and burned them. This story was told by Yousif Kado (1892 – 1971), a priest of Alqosh and the principle of its school in early twentieth century. The Kurdish oppression, abuse, and attacks continued. In 1923, Habib Tomi describes one of such events where a group of Kurds entered the town and demanded free supplies of wheat and barley. The locals refused. A battle ensued; luckily, the aggressors were rebuffed this time. Assyrian traditions speak highly about this wonderful town and its patriotic stand throughout history. In 1919, the town folks came out celebrating the arrival of Agha Potrus, one of the Assyrian heroes during the Great War (1914 – 1918). In August 1933, Crown Prince Ghazi ordered Bakir Sidqi, a Kurdish officer in the Iraqi Army, to massacre the Assyrians after the events on the Iraq-Syria borders at Fish-Khabor. The helpless and armless Assyrians fled. Hundreds of Assyrian families took refuge in Alqosh and filled the town while 3,000 were massacred at the village of Simele. There were homes that had up to 60 Assyrians staying there. The Iraqi Army moved its forces south of the town and placed its cannons around it. The Iraqi army demanded from the folks in Alqosh to deliver the helpless Assyrians to government forces; however, Alqosh folks and mayor refused and informed the army that they will fight until the last man in defense of their brethrens. The army began its plans to attack the town; however, and miraculously, a group of Alqosh notables, including "Rayis" Yousif Poula, Shisha Golla, Jajjo Tammo, Elias Poula, Hanna Estifan, and Yacoub Hakim successfully reached Mosul and informed the patriarch of the Chaldean Catholic Church that Alqosh was about to be attacked. The French and Italian Consulates and the French missionaries were contacted immediately. With much pressure from the French, the Iraqi army withdrew from Alqosh, the town was not attacked, and the Assyrian refugees were saved. Alqosh is an Assyrian town since time immemorial. It was the seat of the patriarchs of the Church of the East for many centuries. The Assyrians (known also as Chaldeans and Suryan) are facing dangerous times due to the aggression, oppression, persecution, Arabization, and lately Kurdification policies. Alqosh must be joined with the other Assyrian towns in the Nineveh plain, such as Karamlesh, Bartella, Baghdeda, Baqufa, Tellosqof, Batnaya, Tel Kepe, and others as a special administrative region, within the Republic of Iraq, for the Assyrian Christians. History has proved that this is the only way that can guarantee the survival of the indigenous Assyrians on their ancestral lands. Wilmshurst, David. The Ecclesiastical Organization of the Church of the East, 1318 – 1913. In Corpus Scriptorum Christianorum Orientalium. Lovanii: Peeters, 2000. Tomi, Habib Y. Alqosh: Dirasa Anthropologiya, Ijtima'aiya, Thaqafiya (Alqosh: Social Anthropology and Cultural Study). Baghdad: Sharikat al-Deewan li al-Tiba'aa, 2001. Hannonah, Habib. Kanisat al-Mashriq fi Sahil Naynawa (The Church of the East in the Nineveh Plain). Amman, Jordan: 1991. Mengozzi, Alessandro. Israel of Alqosh and Joseph of TelKepe. In Corpus Scriptorum Christianorum Orientalium. Vol. 590. Tomus 231. Lovanii: Peeters, 2002. Aboona, Alber. Tareekh al-Kaneesa al-Suryaniya al-Sharqiya. Beirut: Dar al-Mashriq, 1992. Damman, Nabil Younis. Al-Ri'aasa fi Baldat Alqosh (The Leadership in the Town of Alqosh). USA: 2001.